The next few posts I will be going over how altars and shrines can change over time. My hope is that this will give people different ideas of how altars and shrines can be made, what can go on them, and help people see a different way of doing things. When I lived in the dorms this is what my altar/shrine looked like. Everything was together onto this little dresser. The only other flat surface I had needed to keep my desktop PC and studying desk. So, my Gods, Ancestors, and spirits all shared space on this tiny little thing. I wasn’t supposed to light the candles or use the censer in the back. There was a single offering chalice for all the varied Gods, Ancestors, and spirits present, and when liquid offerings needed to be poured out I either did so in the sink, or took it out to the trees near to the dorm rooms. Starting on the left was my tarot and my athame/working dagger, and behind them the mead I gave for offerings. In the back, to the right of the mead, was water I had collected from a lake, and a Chaos Star I had won in a raffle to the right of that. The box beneath the censer contained things like prayer beads, as did the box behind A Book of Pagan Prayer. To the right of the chalice was my representation of the Ancestors (it still serves that purpose) and of course, Odin with representations of Geri and Freki. The little pouch before the Ancestors to the left of the Wolves was given to me as Gebo for help I gave to someone. Thor’s Hammer, Mjolnir, sat resting before Odin’s feet. In front of the Wolves to the left is Brighid’s Candle, and to the right is Her Cross. 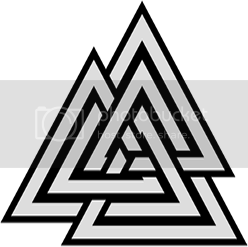 In between the wands and Wolves were two sigils to the angel Haniel, who I asked to help me in my relationship at the time. The silver skulls were what I used as representation of the Dead and as prayer beads (if memory serves) to that purpose. In front of the Dead representation are wands, while the ceramic container was used to hold herb offerings. To the right of the skulls was an offering of an apple, which, after a day or three, was taken outside and put under a tree. 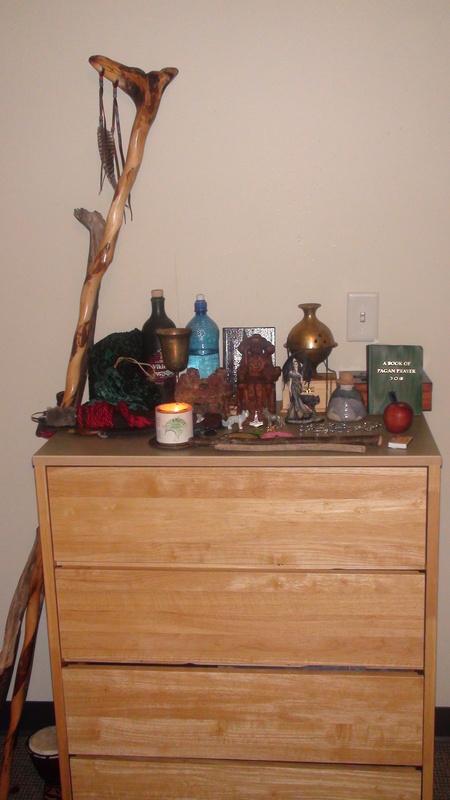 The altar/shrine was near the door to the dorm room, and since I didn’t want to get brained every time I came home, the staves were set on the left of the altar. A lot of this altar was put together the way it was out of necessity. It taught me to use space effectively, and making sure I knew what was essential to me, both in terms of representation, and what I was worshiping and working with. My Altar/Shrine in my dorm room back in 2010. 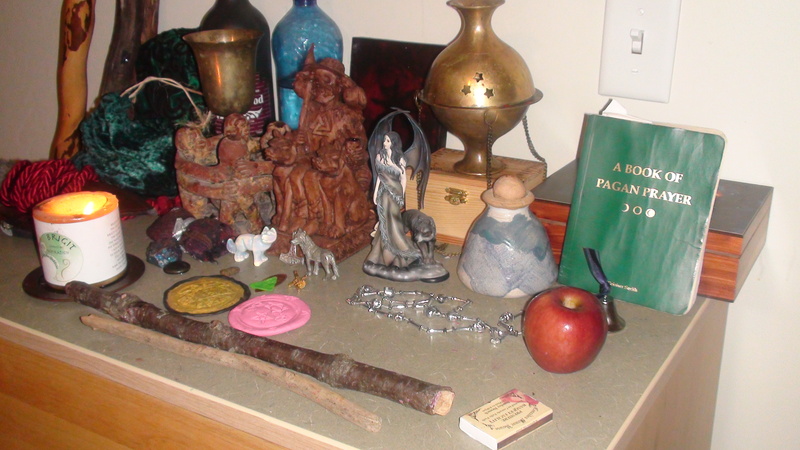 A side shot of my Altar/Shrine in my dorm room back in 2010.